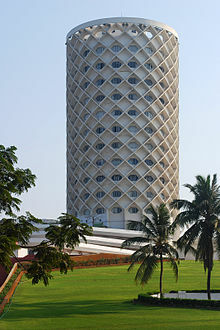 Nehru Centre is a memorial to Jawaharlal Nehru in Mumbai. The purpose of this Centre is to promote the teachings and ideals of Nehru through educational and cultural programmes. The Centre organises scientific, cultural and educational activities. Nehru Centre was conceived in 1972 in Bombay (now Mumbai), India by the late Shri Rajni Patel (an eminent criminal lawyer). The foundation stone of this magnificent dream was laid by the late Indira Gandhi on 2 November 1972 on a six-acre plot leased by the Government of Maharashtra. The centre is spread over 20,000 sq.ft. of space. It consists of a Planetarium, an auditorium for 1000 people, experimental theatre, art galleries, library and research centres. This planetarium was commissioned on 3 March 1977. It has grown into a centre for scientific study of astronomy and for meeting of scientists and scholars for discussions and lectures. Events like Science quiz contests, Astro-painting, Science elocution, Astro-poetry and Astro-quiz competitions are organised in order to inspire students. Discovery of India consists of 14 galleries depicting every aspect of artistic, intellectual and philosophical attainment of India through ages. This exposition seeks to determine true identity of the country. This department also holds activities such as Discovery of India Elocution Competition, Quiz Competition and Essay Competition and science workshop for students every year. Nehru Centre Library is located on the first floor of the Discovery of India building. It has about 25,000 books on various disciplines like religion, philosophy, social sciences, astronomy and allied sciences, arts and architecture, literature, history, geography and biographies. There is also a good collection of books on and by Pt. Jawahar Lal Nehru and Mahatma Gandhi. Situated on the ground floor of the Discovery of India building, this gallery consists of two parts. The Nehru Centre Art Gallery is dedicated to promotion of young talent and provides a platform for them to exhibit their work along with that of eminent artists. Regular cultural programmes are organised by Culture wing in all branches of performing arts, like dance, drama, music, etc. Nehru Centre has two well lit and air-conditioned exhibition halls on the ground floor and three on the second floor of the Discovery of India building. Several national and the international exhibitions are held here. Wikimedia Commons has media related to Nehru Centre. This page was last edited on 6 November 2018, at 02:02 (UTC).